Great Plains User Conference (GPUC) is our premier customer event of the year, with targeted Microsoft Dynamics GP training sessions, hands-on learning, structured networking opportunities, and much more. Sponsoring GPUC is a great opportunity to market your complementary products or services with our customers. Sponsors will have numerous ways to interact with attendees and help those seeking to expand or improve their Dynamics GP solutions. Connect with attendees at your booth, at sessions, and during meals. Additionally, GPUC sponsors will have their company collateral distributed in the welcome bags that all attendees will receive. 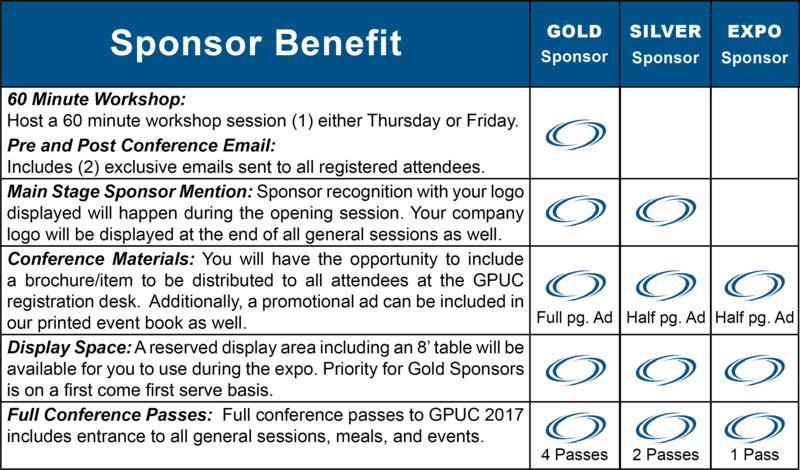 We would love for you to participate and be a sponsor at GPUC 2017! Please list all attendees, and if they plan on golfing/riding along or not.